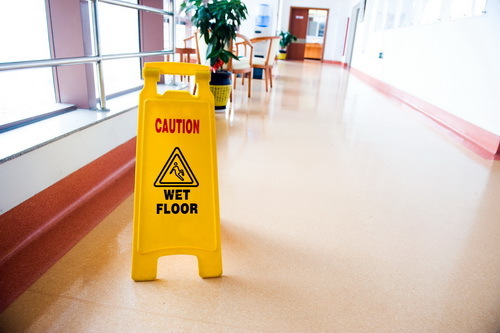 It seems that there are dozens and dozens of companies out there offering office commercial cleaning in Fort Lauderdale, Miami and in both Broward and Dade Counties. 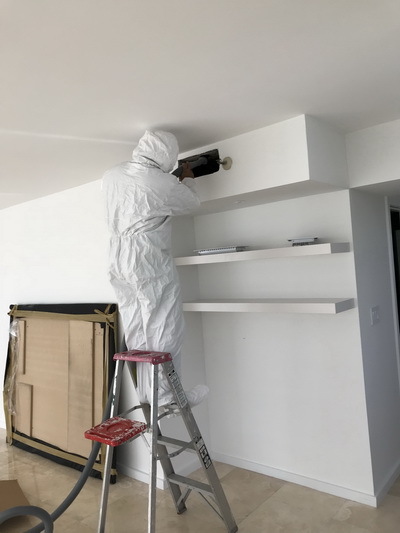 One would think that all you would have to do is toss a dart and you would get a high quality and reputable company for office commercial cleaning in Miami. It’s a sad reality that nothing is farther from the truth. There are so many fly by night commercial cleaning services companies out there that it’s enough to make your head spin. It is essential that you only deal with licensed and insured, reputable companies for office commercial cleaning in Fort Lauderdale. Otherwise, the company could be in for a rude awakening with the quality of service, or lack thereof that they receive. RK Cleaning Services provides the highest quality office commercial cleaning in Miami, Fort Lauderdale and in Broward and Dade counties. It seems like more and more people are becoming increasingly aware of how important it is to ensure that the quality of the air they breathe is good, and free from things that could cause them harm. For the most part, people try to stay away from those who are smoking cigarettes. Even cigarette smokers tend to do so outside of their homes, and not actually inside of the house. While cigarette smoke is definitely something people should avoid, there are plenty of other things that can block and contaminate air ducts within the building. Beauty salons are often home to a plethora of various kinds of caustic chemicals. These chemicals have fumes, and the fumes from coloring, perming, and straightening hair get sucked into the ductwork. These can adhere to the dusts, and create a permanent odor. During a haircut, small snippets of hair can become airborne, and be picked up and get stuck in the air filter however; the filters don’t catch ever single piece of hair. Professional ventilation cleaning services is essential for having quality air inside of your salon. RK Cleaning Services provides air duct cleaning services for commercial businesses. Medical facilities that treat ill people, and take care of those who are well too face a completely different problem when it comes to air quality. Right now, the entire State of Florida is under siege by the flu. People are very, very sick, and some have even died as a result of complications from the flu virus. When people walk into a medical office for help, they don’t expect to go home and in a few days, be in worse shape than when they went in for help. All medical facilities need to have their air ducts sanitized often. RK Cleaning Services offers contractual duct sanitizing services for hospitals and medical facilities. One of the things that commercial property owners tend to completely overlook is the gutter system on their buildings. When a building is constructed, it is generally the rule that gutters are installed on it. There are many reasons for this. Without a proper system to divert rain coming off of the roof, into a downspout, and away from the building, the exterior siding or stucco can become damaged and cracked. Regular rain off of a roof without gutters can actually crack the foundation and cause structural issues. Any kind of structural problem can and will be very expensive to repair, and the building will need to be shut down during such repairs. Not only would this be an outlay of money, but a monetary loss when it comes to income as well. It’s important to keep your gutters in good repair. Any problem with the rain water redirection system should be dealt with promptly. 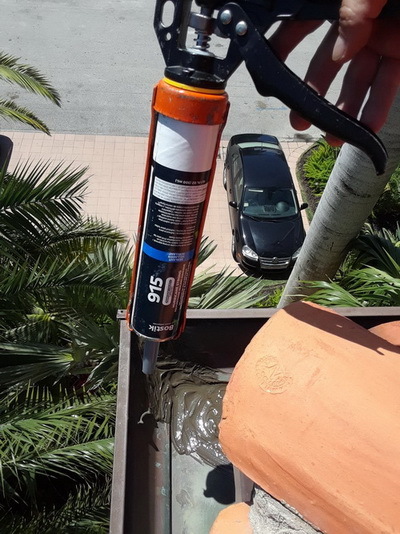 The professionals at RK Cleaning Services use state of the art, Bostik industrial adhesives when repairing gutters for commercial properties. Because a gutter system is meant to redirect the rain from a building, ignoring leaking gutters can be almost as bad as not having them at all. The erosion that can occur from a leak that has been ignored can creating ponding of water on the soil, but can also cause foundational cracks. Proper repair is important. Many companies simply slide the gutters back together, and use a household adhesive to try to prevent the problem recurring. 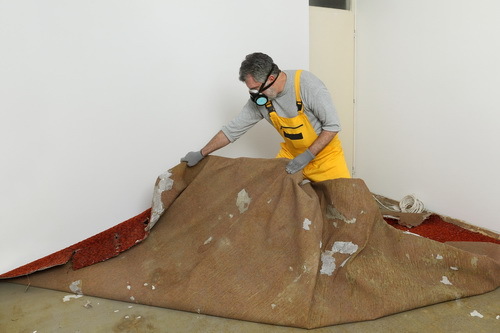 They need to be repaired in a manner than they will be tighter than ever, and sealed completely. 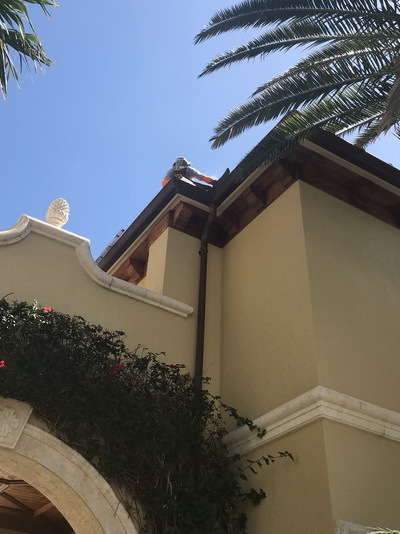 RK Cleaning Services offers complete gutter sealing services for South Florida commercial property owners, and residential property owners as well. 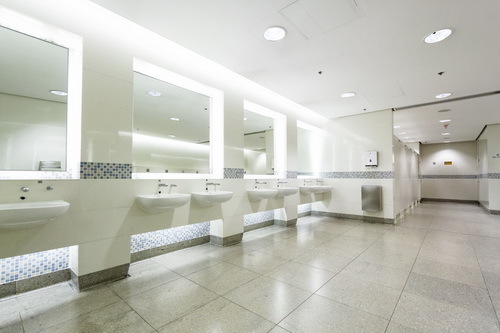 All commercial properties should be maintained in a neat, and clean way, so that it is appealing for those who want to patronize the businesses or offices within it. That’s common sense. Nobody wants to go into a building that’s shabby and looks dirty and unkempt, especially those living or visiting South Florida. There’s a standard that all people expect to be met, and if that standard is not met, people will go elsewhere. It’s really quite simply. Of course, keeping the parking areas tidy is important, but it is equally important to have the windows clean and sparkling. Many commercial buildings have big beautiful windows complementing the architecture however; the windows certainly aren’t complementary if they are dirty, dingy, and water stained. That is definitely not appealing to most consumers, or tenants for that matter. 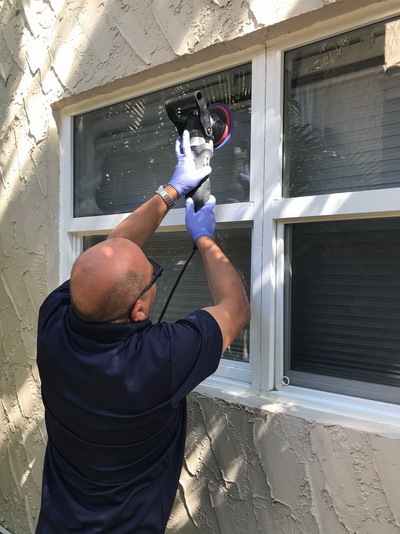 Clean and clear windows show that the owner takes pride in the property, when added to a well-maintained property as a whole. Pride in ownership shouldn’t only be about your home, it should be about every property you own. Commercial properties are investments, so keeping them nice is a wise thing to do. RK Cleaning Services offers restoration services for windows on commercial properties, regardless of the size. It is almost impossible to keep the windows in a high rise commercial building looking clean and free from debris. This is especially true during the rainy season, and even worse when there have been tropical storms or hurricanes. It’s just a part of being in this wonderful piece of paradise. Of course, cleaning inside of the windows is usually handled by housekeeping, but outside must be left to the professionals. 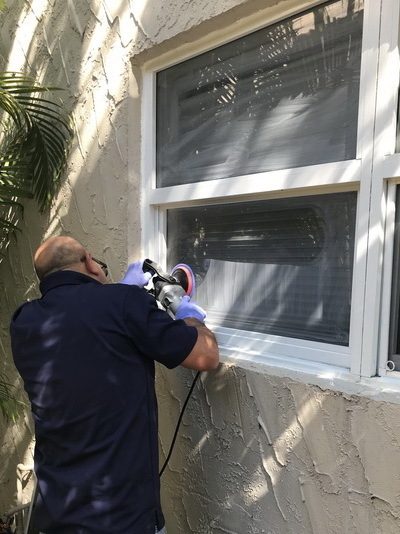 RK Cleaning Services provides quality window washing services for high rise buildings in South Florida. Far too many commercial and residential property owners ignore the importance of having a viable rain water redirection system on their buildings. There are so many problems with having a shoddy, or leaking gutter system that it’s enough to make your head spin. Of course, their will be dirt and debris that gets splashed up on the siding or stucco of the structure, making it look dirty, dingy, and unkempt. 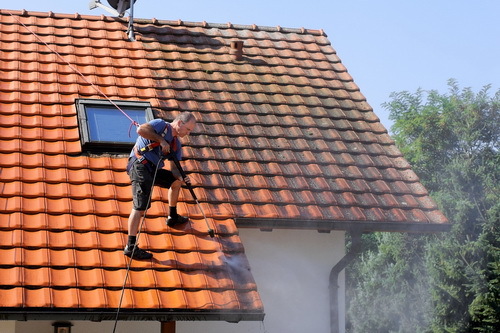 Nobody wants their home or business looking that way, so the owner would need to have the exterior cleaned. Leaking gutters can also cause mold growth along the foundation, and any concrete walkways surrounding the building. 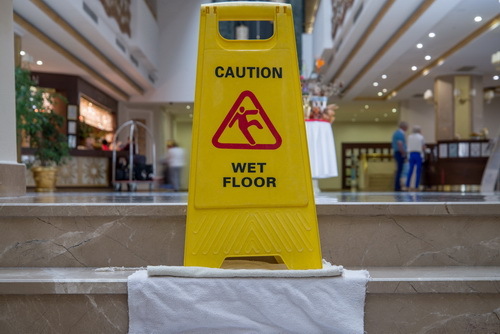 This could be a slip and fall accident and lawsuit waiting to happen. Mold gets slick, and it’s easy to fall once a shoe hits it. It’s better to be proactive, and prevent problems, rather than stick your head in the sand and keep your fingers crossed that nothing will happen. That can come back and bite you in the rear. Keeping the gutters maintained in tiptop condition is very important in many ways. RK Cleaning Services offers complete gutter system maintenance and repair services on commercial and residential structures. One of the biggest problems with having a defective and leaking gutter system is that over time, the water can crack the exterior of the building, and even crack the foundation too. Problems with a foundation can be an absolute nightmare, and very costly as well. It’s unwise to allow serious damage to a building to occur simply because you fail to maintain the gutters. It makes no sense. Prevention is always best way to go. The professionals at RK Cleaning Services use Bostik industrial adhesives, with is accepted as the best gutter adhesive globally. There are so many wonderful things about living and working in beautiful South Florida that there are far too many to mention, without writing a book. Even then, more than likely some things would be missed. One of the things that drive the vast majority of commercial property owners and homeowners crazy is the ugly spotting that happens to the glass windows. It can seem that the windows are clean, but then those spots just reappear like magic. It’s enough to drive you crazy. You could spend hours and hours trying to remove the spots to no avail. Sometimes, it’s a lot better and less stressful to call in the professionals to handle the task. It’s worth it just to avoid the aggravation, and to have windows without those annoying water spots. After all, nobody has the time to waste doing a chore that results in almost improvement. It’s like mopping floors with dirty water, and still expecting the floors to be clean. It’s futile. The professionals at RK Cleaning Services offers expert window cleaners who are adept at removing those nasty hard water stains on the glass. The glass in the windows of commercial properties takes a beating, especially during the rainy season. Many people wonder why water stains appear on their windows. It’s relatively simple. If you take a clear container and put it outside during a rainstorm and allow it to fill, you can look at the water that falls from the sky. It will not be crystal clear like your drinking water. The rainwater will be discolored. For this reason, rainwater must be filtered and sanitized prior to consumption. The particles that you found in the container get deposited on the windows. This causes the spotting on the glass. RK Cleaning Services provide high quality windows restoration services at fair prices.